Understanding and respecting the role of patients' cultural backgrounds, ethnicity, and race is essential to effective clinician–patient communication, especially for advance care planning (ACP; Institute of Medicine [IOM], 2015). ACP has been defined as “a process that supports adults at any age stage of health in understanding and sharing their personal values, life goals, and preferences regarding future medical care” (Sudore et al., 2017, p. 821). During this process, individuals are encouraged to discuss their values and preferences for end-of-life (EOL) care with other family members and/or friends and health care providers and to complete advance directives, such as a living will and a durable power of attorney for health care (DPAHC). The living will specifies the individual's preferences for life support treatments, whereas the DPAHC designates a health care proxy (or proxies) to make medical decisions on the patient's behalf if the patient is unable. Because ACP interventions have been shown to direct care consistent with patients' preferences and reduce psychological distress among family members, there is growing interest in promoting ACP (Sudore et al., 2017). Previous studies, however, have reported less positive attitudes toward ACP and lower rates of advance directive completion among Black/African American, Hispanic, and Asian individuals than among their White peers (IOM, 2015; Kwak & Haley, 2005; Muni, Engelberg, Treece, Dotolo, & Curtis, 2011). These findings have been attributed to cultural factors, such as aversion to direct communication about serious illnesses; poor prognosis; and distrust of the medical care system across various racial/ethnic groups (Bowman, 2004; Carrese & Rhodes, 1995; Kwak & Haley, 2005). Of racial/ethnic groups in the United States, the 567 federally recognized tribal entities (Bureau of Indian Affairs, 2018) of American Indian and Alaska Native individuals are among the least studied populations with respect to ACP practices. American Indian individuals live in widely different regional locations and have varying cultural and religious values, beliefs, and attitudes. Nonetheless, the literature suggests that basic tenets of ACP (i.e., exercising autonomy and control over one's health care by planning in advance) may be at odds with traditional American Indian perspectives, which contributes to lower ACP among American Indian individuals than their White peers (Carrese & Rhodes, 1995, 2000; Colclough & Brown, 2014a,b; Dennis & Washington, 2018). Four qualitative studies have identified several indigenous beliefs among American Indian individuals that suggest reasons for negative attitudes toward advance directives (Carrese & Rhodes, 1995, 2000; Colclough & Brown, 2014a; Dennis & Washington, 2018). These beliefs include a cultural emphasis on focus on the present moment; a belief in the power of words, which can lead to an avoidance of negative discourse; views of death as a natural event; and prioritization of family and community over individuals, such that death or caregiving at EOL need not be pre-arranged. Nevertheless, a survey of tribal health directors of the Indian Health Service found that 58% of respondents identified a need for ACP in their communities (Michalek, Mahoney, Gilbert, & Kaur, 2005). Although another survey of 2,533 adults in South Dakota found no significant difference in the rate of ACP between American Indian and non–American Indian individuals, the study sample included only 71 American Indian individuals, with no multivariate analysis results provided (Schrader, Nelson, & Eidsness, 2009). Such qualitative and descriptive findings have helped increase awareness of important cultural values, beliefs, and practices regarding communication about EOL issues as well as limited availability of ACP and palliative care services in American Indian communities. Nevertheless, a need exists for further examination of ACP practices among American Indian individuals and of factors that may influence those practices. The current researchers therefore conducted an atheoretical cross-sectional survey of 636 older adults (200 American Indian and 436 non-Hispanic White individuals) from two Midwestern states to explore associations between individual factors and ACP in American Indian individuals. Researchers began the survey with a convenience sample of 755 rural and urban adults in two states, Minnesota and South Dakota. Following approval from the Institutional Review Board at the University of South Dakota, data were collected from January through May 2013. To be included, participants had to be 50 years or older, as rates of morbidity and mortality are higher at an earlier age in American Indian individuals compared to rates of the majority population (Goins & Pilkerton, 2010; Hayward & Heron, 1999). Participants also had to be free of cognitive impairment as assessed by the Short Portable Mental Status Questionnaire (Pfeiffer, 1975). Efforts were made to recruit American Indian individuals who self-identified as American Indian from off-reservation locations including American Indian churches, social service agencies, and three sun dance pow wows. Recruitment sites included local churches, social service centers, senior housing facilities, senior centers, food pantries, and sun dance pow wows. Prior to administering the survey, trained interviewers (S.R. and others) explained the study's purpose and procedures, the scope of questions that would be asked, confidentiality regarding data, and the study's benefits and risks. American Indian college students served as trained interviewers for American Indian participants. All participants gave informed written consent prior to completing the self-administered survey, during which trained interviewers were available for assistance; five participants needed help with the survey. The survey took approximately 30 minutes to complete, and respondents received $10 cash for participation. For analysis, non–American Indian/non-White individuals (n = 11) were excluded, and in the final models, only surveys with no missing values on all variables of interest were included, leaving a final sample of 636 participants (436 White older adults, 200 American Indian older adults). Demographic and Background Characteristics. Participants provided their age (years), gender (0 = male, 1 = female), race (0 = White, 1 = American Indian), marital status (0 = not married, 1 = married), and educational attainment (1 = less than high school, 2 = high school graduate, 3 = college or above). Overall Health Needs and Insurance. Serious chronic conditions and depression have been associated with ACP (Rao, Anderson, Lin, & Laux, 2014). Participants were therefore asked whether they had any of 10 specific diseases (e.g., arthritis, stroke, heart problems, diabetes, cancer), using a list of diseases adopted from the Older Americans Resources and Services Questionnaire (Fillenbaum & Smyer, 1981) and summing numbers of yes responses as a score (range = 0 to 10). Depressive symptoms were assessed with the 15-item Geriatric Depression Scale-Short Form (yes/no; α = 0.81; Sheikh & Yesavage, 1986). Scores ranged from 0 (no depressive symptoms) to 15 (severe depressive symptoms). A single additional item addressed health insurance coverage (0 = no, 1 = yes). Major Stressors. Three of the 31 items on the Elders Life Stress Inventory (α = 0.75; Aldwin, 1990) were used to ask participants whether they had experienced any major personal injury or illness, death of a spouse, or institutionalization of a spouse. It has been suggested that these events may motivate individuals to complete advance directives (Carr & Khodyakov, 2007). Religious Beliefs and Practice. Participants were asked to provide their religious affiliations as follows: Catholic, Protestant, Buddhist, Native American spiritual practice, Other, or None. Participants also rated their religious/spiritual beliefs' importance as not at all important, somewhat important, or very important. Scores on the Intrinsic Religiosity Subscale (three items) from the Duke University Religion Index (α= 0.84; Koenig, Parkerson, & Meador, 1997) were summed to assess religious belief and experience. Scores on each item ranged from 1 to 5, with higher scores reflecting greater religiosity. Advance Care Planning. Researchers asked participants three questions about ACP behavior that were developed for, pilot tested, and used in previous studies with caregivers of individuals with dementia and Parkinson's disease (Kwak, De Larwelle, Valuch, & Kesler, 2016). Questions included: (a) “Have you made plans about the types of medical treatment you want or do not want if you become seriously ill in the future?”; (b) “Have you made any legal arrangements for someone to make decisions about your medical care if you become unable to make those decisions for yourself? These arrangements are sometimes called a durable power of attorney for health care or health care proxy”; and (c) “Do you have a living will or advance directive? These documents are written instructions about the type of medical treatment you would want to receive if you were unable to make decisions yourself.” Response options were yes (1) or no (0). To examine the sample's characteristics and the study variables, descriptive analysis was used. Logistic regression models were then conducted to estimate the adjusted odds ratios (ORs) of having a DPAHC and a living will for American Indian individuals in comparison with their White counterparts, while controlling for study variables described above. Statistical analyses were conducted using Stata, Release 14. The mean age of participants was 68.01 years (SD = 11.44 years); 63.5% of participants were female, 46.5% were married, 52.5% were high school graduates, and 84.1% had an annual income <$60,000 (Table 1). Most had health insurance (83.5%) and identified themselves as Protestant (51.3%). Forty-five percent reported having experienced a major personal injury or illness; 24.5% reported having experienced death of a spouse; and 13.5% reported having experienced institutionalization of a spouse. The mean number of chronic medical conditions was 2.19 (SD = 1.61), and mean scores for depression and religiosity were 2.09 on the Geriatric Depression Scale (SD = 2.50) and 1.67 on the Duke University Religion Index (SD = 0.91), respectively. With respect to the two groups, American Indian individuals were considerably younger than their White peers (mean 60.32 years vs. 71.54 years, p < 0.001); fewer American Indian individuals were married (35% vs. 51.8%, p < 0.001); and fewer had health insurance (62% vs. 93.4%, p < 0.001). More White individuals than American Indian individuals were female (68.1% vs. 53.5%, p < 0.001). A greater percentage of American Indian than White individuals had a college education or above (50% vs. 33.5%, p < 0.001), had income less than $20,000 per year (42.5% vs. 32.8%, p < 0.05), and had experienced death (29.6% vs. 22.3%, p < 0.05) or institutionalization (21.5% vs. 9.9%, p < 0.001) of a spouse. Among American Indian individuals, 45% reported their religion as Native American spiritual practices and 16.5% identified as Protestant, whereas among White individuals, 11% and 67.2% reported practicing Native American spiritual practices and being Protestant, respectively (p < 0.001). American Indian individuals scored higher on the Duke University Religion Index than White individuals (1.79 vs. 1.61, p < 0.05). Most (57.4%) participants said they had made a plan for EOL care and had completed a DPAHC (50.6%) and a living will (50.3%) (Table 1). However, univariate results showed that American Indian individuals were significantly less likely to have engaged in ACP than their White peers: American Indian individuals were less likely to have made a plan about EOL care (43.5% vs. 63.8%), completed a DPAHC (32.5% vs. 58.9%), or completed a living will (29% vs. 60.1%; p < 0.001). 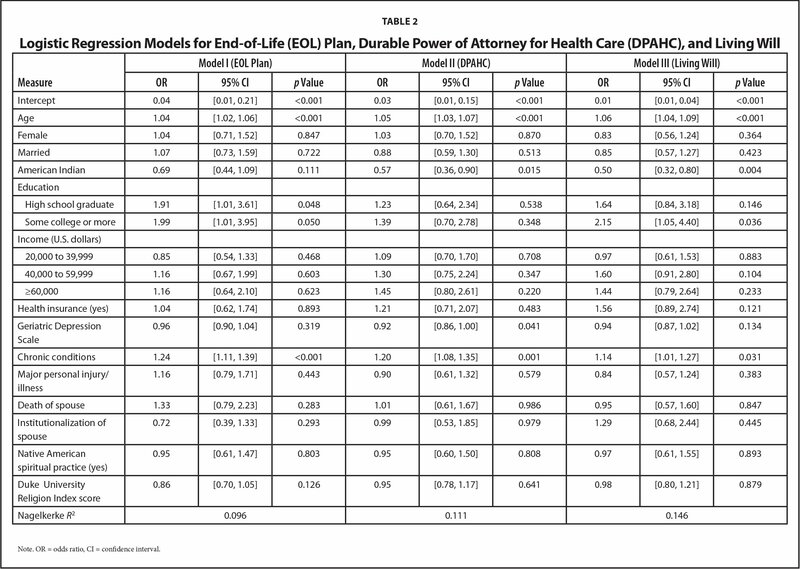 Results of logistic regression for having an EOL plan and completing a DPAHC and a living will are shown in Table 2. Having an EOL plan was associated with being older (OR = 1.04, 95% confidence interval [CI] [1.02, 1.06]), having some or more college education (OR = 1.99, 95% CI [1.01, 3.95]), and having a greater number of chronic conditions (OR = 1.24, 95% CI [1.11, 1.39]). 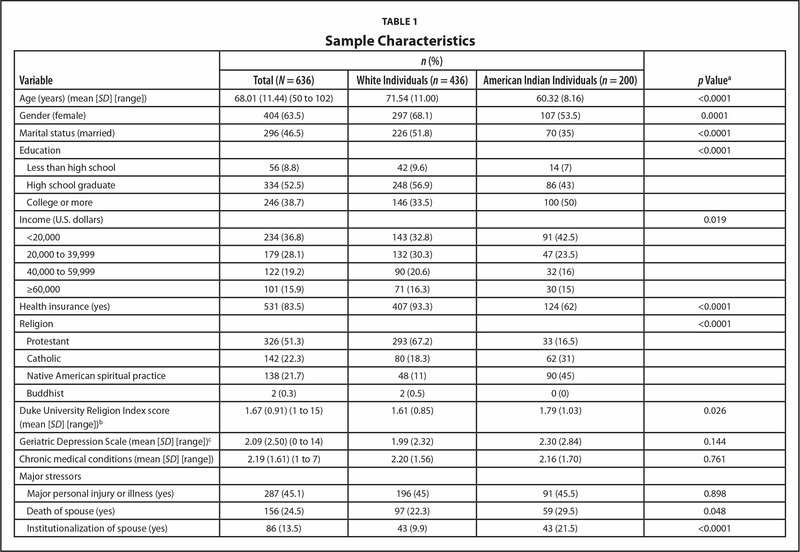 In the model for completing a DPAHC, being American Indian (OR = 0.57, 95% CI [0.36, 0.90]) and being older (OR = 1.05, 95% CI [1.03, 1.07]) were associated with completing a DPAHC. Respondents with more depressive symptoms were less likely to complete a DPAHC (OR = 0.92, 95% CI [0.86, 1.00]), whereas respondents with more chronic conditions were more likely to have completed a DPAHC (OR = 1.20, 95% CI [1.08, 1.35]). In the model for living will, being American Indian (OR = 0.50, 95% CI [0.32, 0.80]) and being older (OR = 1.06, 95% CI [1.04, 1.09]) were associated with completing a living will. Having some college education or more was associated with completing a living will (OR = 2.15, 95% CI [1.05, 4.40]), as was the number of chronic conditions (OR = 1.14, 95% CI [1.01, 1.27]). Past studies of ACP in American Indian individuals, mostly qualitative and descriptive, have reported that American Indian individuals are less likely to engage in ACP due to cultural differences and health disparities. In the current study, researchers explored individual characteristics associated with ACP in a sample of American Indian older adults and their White peers. Having an EOL plan was broadly defined as whether respondents had made plans about types of medical treatment if they were to become seriously ill in the future. Researchers found that although the unadjusted rate for EOL planning was lower among American Indian than White individuals (43.5% vs. 63.8%), American Indian individuals were as likely to plan for EOL care as their White peers when controlling for group differences in other individual characteristics, including age, gender, marital status, education, income, and insurance status, as well as spiritual and religious practices. For American Indian individuals, the available literature suggests the importance of cultural, religious, and spiritual belief systems for EOL communication, such as views of death as a natural part of a continuum of spiritual existence, just as life is also part of this continuum (Palmer & Palmer, 2006), and norms that lead one to avoid direct references to EOL and focus on the present moment (Carrese & Rhodes, 1995, 2000). Researchers attempted to test the role of culture by including Native American spiritual practices and items from the Duke University Religion Index in the multivariate model as proxies for American Indian cultural and spiritual beliefs and practices. However, these factors were not significantly associated with EOL care planning; instead, the significant correlates in the current sample were older age, having some or more college education, and having a greater number of chronic conditions. The ACP literature (IOM, 2015) has consistently documented that older adults with health problems and higher educational levels are more likely to engage in ACP because they may have more opportunities to learn and think about EOL care planning via encounters with health care providers as well as family members or friends at EOL. In addition, in the past decade, community-based educational interventions and campaigns have been undertaken to promote EOL discussions, improve public awareness of EOL care choices, and document preferences in the general population as well as in racial/ethnic minority groups (Huang et al., 2016). A recent qualitative study of Ojibwe older adults (Dennis & Washington, 2018) suggests that American Indian older adults may be more open to discussing ACP than in the past. Therefore, factors such as age, health status, and exposure to EOL topics and discussion opportunities may have an influence as great as that of cultural norms on whether older adults plan for their future EOL care informally. Regarding formal ACP, however, the current results support the findings of prior descriptive research that suggest lower likelihood of completing advance directives among American Indian than non–American Indian individuals. For example, a survey of older adults in South Dakota (Schrader et al., 2009) reported advance directive completion rates of 25% for American Indian individuals and 34% for non–American Indian individuals. In the current study, unadjusted completion rates for DPAHCs and living wills were 33% and 29% for American Indian individuals, whereas for non-American Indian individuals, they were 59% and 60%, respectively. After controlling for other individual characteristics, the odds of American Indian individuals completing two forms of advance directives (DPAHCs and living wills) were approximately one half the odds of their White peers. This racial difference in formal ACP even after controlling for spiritual and religious practices might be explained in part by disparities in availability of and access to information and resources for ACP. Persistent disparities in health and health care experienced by American Indian individuals are well documented. American Indian individuals experience higher rates of death and disease than their counterparts, compounded by geographic isolation, poverty, high rates of non-insurance, and significant barriers to obtaining care (Office of Minority Health, 2017). The literature suggests that American Indian individuals at EOL seek care at later stages of disease and consequently experience lower rates of survival, in part due to disparities and lack of options for palliative care (Kitzes, 2002; Marr, Neale, Wolfe, & Kitzes, 2012). Hospice services, ACP, bereavement support, and other palliative services are often unavailable to tribal members, patients, and families living in rural areas (Domer & Kaur, 2008; Michalek et al., 2005; Robinson et al., 2009). Varying requirements in state laws for advance directives (e.g., regarding who can serve as health care agents and limitations on their authority) and problems with forms, such as poor readability and lack of clarity, may create even greater barriers to American Indian individuals' completion of advance directives (IOM, 2015). Findings of the current study should be interpreted with some limitations in mind. This was a cross-sectional survey with a convenience sample of non-Hispanic White and American Indian older adults from two Midwestern states. The geographically constrained, non-representative sample and self-administered nature of the survey (which required participants to be able to read, write, and participate in a survey) may have led the American Indian subsample in the study to be more educated and healthier than the general American Indian population. These characteristics prohibit causal inference and generalizability. In addition, American Indian populations are extremely heterogeneous, and their EOL care planning may vary significantly by tribe and region. Because the data did not include information on tribal membership, researchers could not examine tribal or regional differences. Subsequent research with more representative samples of American Indian older adults across diverse tribes and regions will provide a fuller picture of ACP practices. Furthermore, the instruments used to measure religious beliefs and practices were not specific enough to adequately capture the complexity of the spiritual and religious dimensions of American Indian cultural traditions and their relevance in EOL care planning. Spiritual beliefs represent only one of many aspects of American Indian culture. Dual spirituality, the practice of incorporating traditional beliefs into Western religious values (e.g., some form of Christianity), is also common among American Indian individuals. Despite its extensive use with diverse populations, the Duke University Religion Index was originally designed to measure religiosity in Western religions (e.g., Christianity, Judaism, Islam), not American Indian tribes. Finally, it is possible that using a self-report survey might have led participants to provide socially desirable responses, such as with regard to ACP; these responses might have resulted in an overestimation of ACP, as actual completion of advance directives was not verified. The current findings suggest that although participation in formal ACP is lower for American Indian individuals than for their White peers, American Indian individuals may be likely to consider and plan for EOL care if efforts are made to develop and deliver culturally sensitive ACP support and palliative care programs and services. Nurses can play an important role in bridging cultural differences and reducing disparities in American Indian communities. As key members of health care teams, nurses can facilitate communication and trust between patients, families, and health care teams in ways deeply grounded in an understanding of indigenous health belief systems, traditional healing practices, and decision-making, combined with high standards for quality palliative care. Barriers to culturally sensitive communication or conversations about EOL include American Indian individuals' discomfort talking about EOL issues; providers' lack of knowledge about patients' cultural beliefs, values, and practices; and lack of training on communication for providers (Baile, Lenzi, Parker, Buckman, & Cohen, 2002; Periyakoil, Neri, & Kraemer, 2015; Weiner & Cole, 2004). Nurses can develop culturally sensitive training curricula that address how to explore preferences of patients and families, including whom patients want to be present in discussions about EOL and how they want to receive information (Baldridge, n.d.; Marr et al., 2012). Training curricula should also emphasize how to build patients' and families' trust by communicating with care, respect, and hope in EOL discussions. Such trusted relationships between patients and providers are fundamental to sharing sensitive information about EOL wishes; and health care professionals who are culturally competent and invested in the patient, family, and community are more likely to be thought trustworthy by minority patients such as American Indian individuals (Baldridge, n.d.). In addition, efforts to increase access to culturally sensitive palliative services should be made in collaboration with tribal leadership, program staff, and local communities, as well as national entities (Finke, Bowannie, & Kitzes, 2004; Hampton, 2005). The Fort Defiance Home-Based Care Program, in which the completion rate of advance directives is three times higher than the national average, is a good example of such an effort (Baldridge, n.d.). This program has succeeded in addressing access and cultural barriers by providing culturally sensitive verbal and visual information and training native home care staff members about answering difficult questions in a culturally acceptable manner. The current study's findings contribute to the literature on ACP among American Indian individuals by exploring associations between various individual characteristics and ACP practices among this population This study adds to knowledge of racial and ethnic differences in ACP within a group that has received limited attention in comparison with other minority groups. The differences found in completion rates of advance directives, despite EOL planning and discussions comparable to those for the general population, suggest the importance of culturally competent education efforts to promote ACP in American Indian communities. Aldwin, C.M. (1990). The elders life stress inventory: Egocentric and nonegocentric stress. In Stephens, M.A.P., Crowther, J.H., Hobfoll, S.E. & Tennenbaum, D.L. (Eds. ), Stress and coping in later-life families (pp. 49–69). New York, NY: Hemisphere. Bureau of Indian Affairs. (2018). Indian entities recognized and eligible to receive services from the United States Bureau of Indian Affairs. Federal Register, 83, 4235–4241. Domer, T. & Kaur, J.S. (2008). Palliative practice in Indian health. South Dakota Medicine, Spec No., 36–40. Institute of Medicine. (2015). Dying in America: Improving quality and honoring individual preferences near the end of life. Washington, DC: National Academies Press. Palmer, R.C. & Palmer, M.L. (2006). Ojibwe beliefs and rituals in end-of-life care. In Puchalski, C.M. (Ed. ), A time for listening and caring: Spirituality and the care of the chronically ill and dying (pp. 215–225). New York, NY: Oxford University Press. Sheikh, J.I. & Yesavage, J.A. (1986). Geriatric Depression Scale (GDS): Recent evidence and development of a shorter version. In Brink, T.L. (Ed. ), Clinical gerontology: A guide to assessment and intervention (pp. 165–173). New York, NY: Haworth Press. Dr. Kwak is Associate Professor, School of Nursing, The University of Texas at Austin, Austin, Texas; Dr. Cho is Associate Professor, Zilber School of Public Health, University of Wisconsin-Milwaukee, Milwaukee, Wisconsin; Dr. Lee is Associate Professor, School of Social Work, San Francisco State University, San Francisco, California; Dr. Noh is Associate Professor, School of Social Work, The University of Alabama, Tuscaloosa, Alabama; and Dr. Roh is Associate Professor, Department of Social Work, University of South Dakota, Sioux Falls, South Dakota. The authors thank Katharine O'Connell-Valuch (Center for Aging and Translational Research, University of Wisconsin-Milwaukee) for assistance with proofreading and formatting of the manuscript. Editorial support with manuscript development was provided by the Cain Center for Nursing Research and the Center for Transdisciplinary Collaborative Research in Self-management Science (P30, NR015335) at The University of Texas at Austin School of Nursing. The data used in the study were collected with support from the University of South Dakota's Internal Grants for New Faculty Research and Creative Activity, awarded to Dr. Roh. Address correspondence to Jung Kwak, PhD, MSW, Associate Professor, School of Nursing, The University of Texas at Austin, 1610 Red River Street, Mail Code: D0100, Austin, TX 78701; e-mail: jkwak@nursing.utexas.edu.